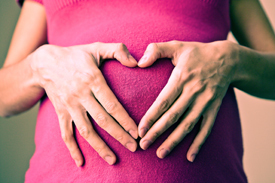 How can chiropractic add comfort during pregnancy? Chiropractic care in pregnancy is an essential ingredient to your prenatal care choices. Preexisting but unnoticed imbalances in your spine and pelvis become stressed during pregnancy. These pronounced discomforts make it difficult to perform routine, daily activities. A large percent of all pregnant women experience back discomfort/pain during pregnancy. This is due to the rapid growth of the baby and interferences to your body’s normal structural adaptations to that growth. Chiropractic care throughout pregnancy can relieve and even prevent the common discomforts experienced in pregnancy. Specific adjustments eliminate the causes of stress in the spine. As your baby develops, your uterus enlarges to accommodate the rapid growth. When the pelvis is in a balanced state, the ligaments connected to the uterus maintain an equalized, supportive suspension for the uterus. If your pelvis is out of balance in any way, these ligaments become torqued and twisted, causing a condition known as intrauterine constraint. This constraint restricts the baby’s movement and eventual optimal positioning. Any compromised for the baby throughout pregnancy will affect his or her development. Conditions such as torticollis occur because a baby’s space was cramped in utero. If there is intrauterine constraint as birth approaches, the baby is prevented from getting into the best possible position for birth. Even if the baby is in the desirable head down position, oftentimes intrauterine constraint prevents the baby’s head from moving into the ideal presentation for delivery. In some cases, the baby does not have the room to move head down and is considered to be breech. Any baby position even slightly off during birth will slow down labor, and add pain and distress to both the mother and baby. Many women have been told that their babies were too big, or labor “just slowed down” when it was really the baby’s presentation interfering with the normal process and progression. Avoidable interventions are implemented, turning a natural process into an operative one. Dr. Zacherl recommends the After Baby Ab Tank, by Bellies, Inc., It’s the ultimate postpartum recovery solution. One such technique used for breech position is called the Webster Technique. Dr. Larry Webster, founder of the International Chiropractic Pediatric Association discovered this adjustment as a safe means to restore proper pelvic balance and function. Because of the particular female adaptations from the increase of hormones, weight gain and postural adaptations, pregnant mothers have a greater chance of sacral subluxation and neuro-biomechanical imbalance than the general population. Additionally, because of the effect the chiropractic adjustment has on all body functions by reducing nerve system stress, pregnant mothers should have their spines checked regularly throughout pregnancy, optimizing health benefits for both the mother and baby. Call our Erie chiropractic office today to learn more about how we can support your healthy pregnancy and birth!